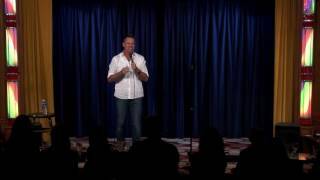 Chris Franjola is a writer/comedian born and raised on Long Island who now lives and works in Los Angeles. He’s currently a writer and a regular performer on E!’s hit show “Chelsea Lately.” Chris also starred on the critically acclaimed scripted comedy series “After Lately,” which aired for three seasons on E! He is also the host of the Sons of Anarchy aftershow Anarchy Afterword, airing live on FX. When he isn’t busy writing and acting, he’s performing stand-up on the road, headlining venues all over the country. Before Chelsea Lately, Chris wrote for other shows, including Family Guy, the MTV Video Music Awards, and the original Chelsea Handler Show.